We are approaching the end of the year where investors are facing a confluence of mixed signals such as tax loss selling, fiscal cliff discussions, the Greek bailout, future Fed actions and Middle Eastern geopolitical turmoil. Short term shakeouts like Wednesday’s early morning drop in precious metals should be expected. The precious metals markets appeared to have found support of a massive sell order at the open. We may see more turbulence as investors react to news driven reports emanating from the gridlock in Washington. Nevertheless, we ignore the daily volatility and stick to the long term technicals and fundamentals which may be signaling that gold, silver, platinum group metals, uranium and heavy rare earths may reemerge as sectors where opportunity lies in 2013. 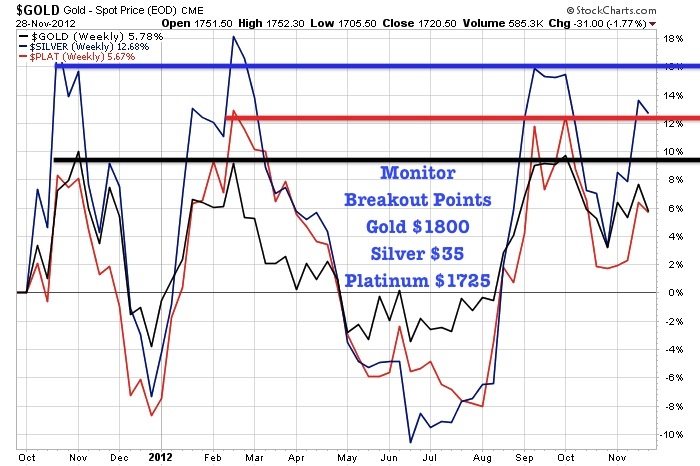 Gold, silver and platinum appear to be on the verge of a major breakout as the Fed may be making noises about QE4. The volatility in the mining equities going into 2013 may provide cheap, bargain basement opportunities for investors who have a long term horizon and want to pick up cheap mining equities backed by gold, silver and/or PGMs. As we head into the end of the year, gold, silver and platinum look like they may be on the verge of a major breakout at $1,800 gold, $1725 platinum and $35 silver with silver outperforming. This outperformance by silver and platinum may be signaling a risk on rally which may be precipitated by a fiscal cliff resolution or further accommodative moves by the Federal Reserve to replace Operation Twist with QE4. The precious metals sector appears to have bottomed this summer ahead of the open-ended QE3 announcement. Click here to see where we called the bottom in May. We may be on the verge of another major breakout as the precious metals market may be once again pricing in the next Keynesian move. Any progress with the fiscal cliff plus an announcement of QE4 in 2013, where the Fed may expand its balance sheet to purchase long term treasuries could spark a hyper inflationary rally. This could have a dramatic bullish effect on our sectors and this may already be reflected in the rising prices of gold, platinum and silver which is on the verge of a breakout. 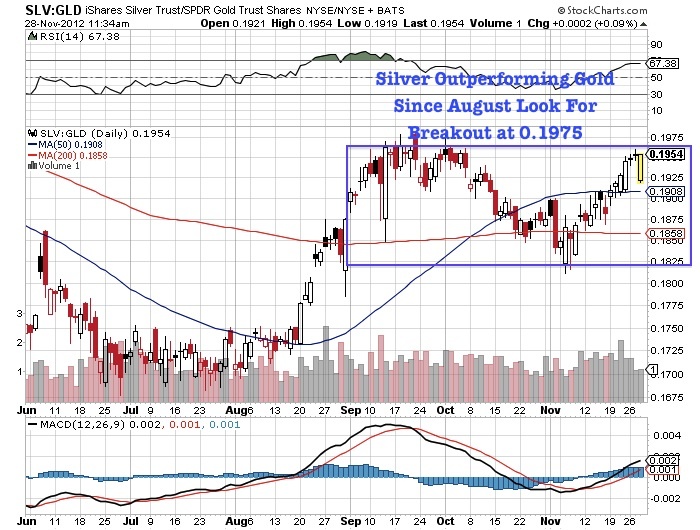 Silver has been outperforming since August and is on the verge of a six-month breakout. Already we are seeing growing demand for precious metals from emerging economies with new Asian ETFs. In addition, industrial demand for silver and platinum may pick up as China catches up to the US in demand for high tech electronics and automobiles. Remember when silver topped in April 2011 from a series of margin rate hikes the entire commodity market slumped into an extended decline. A breakout for precious metals could possibly spark an inflationary “risk on” rally which may be the catalyst for a rotation from the overvalued large caps into undervalued mining equities. Disclosure: Author Is long gold and silver.